What is a Hawaii Promissory Note? Hawaii Promissory Note: What Is It? A Hawaii promissory note is a legally binding agreement that documents a loan that was provided from the lender to the borrower. The note may use the terms “lender” and “borrower” or it may use “promissee” and “promissor.” A Hawaii promissory note may be secured or unsecured. When a promissory note is secured, the lender is given the right to collect certain property, known as collateral, if the borrower doesn’t pay the loan as promised. Unsecured promissory notes does not give the lender the right to claim property for the balance of the loan. Commercial promissory notes are governed by Article 3 of the Hawaii UCC (490:3) and Hawaii common law. Hawaii promissory notes are also subject to laws related to collections and interest rates. Interest may be charged on Hawaii promissory notes. Hawaii Revised Statutes 478:2 state that the most interest that a lender may charge is 10%. If a lender charges a borrower more than the legal maximum, they are in violation of usury laws. This could cause the lender to face serious legal problems. Not only might the borrower sue, but the State of Hawaii may also get involved. The date of creation. 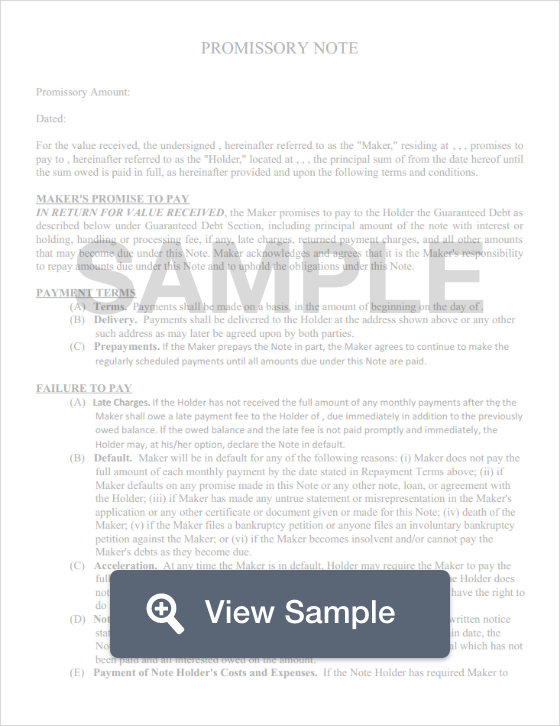 The date the promissory note is created should appear beneath the title of the note. This should be formatted as month, day, and year. It may be abbreviated (01/01/18) or spelled out (January, 1, 2018). The legal name and mailing address for the borrower. The Hawaii promissory note should also put the word “borrower” next to their name. If the promissory note is secured, include the physical address if it is different from the mailing address. The legal name and mailing address for the lender. The lender may be an individual or an entity. The name of the lender should also include their title as the lender. Also, if the payment address is different from the mailing address, it is important to include the payment address in the document where payment arrangements are discussed. The principal amount loaned to the borrower. This is the full amount of money loaned to the borrower. This section does not include what will be paid as interest. Interest is addressed on its own. Before the signing process begins, review the note to ensure that there is no typo in this area. Interest amount on the loan. This is the amount of money the borrower agrees to pay in exchange for the loan. It is often addressed as either “per annum” or as “APR” (annual percentage rate). The most interest that may be charged in Hawaii with a promissory note is 10%. How payments will be made. The most common type of payment arrangement for Hawaii promissory notes is paying in installments. An installment is a payment made on a certain schedule (weekly, biweekly, or even monthly). The payment amount is generally set at the beginning of the agreement and is documented within the note. The promissory note should list how many installments must be paid as well as the amount of each payment and the total amount of what will be paid. If the lender charges a late fee, the amount of the fee as well as when it will be assessed should be included. For secured Hawaii promissory notes, it is important to include a description of the collateral that may be retrieved if the borrower neglects to fulfill their obligations. Interest Due in the Event of Default. This clause explains the amount of interest that must be paid by the borrower if they default on the arrangement. Payment Allocation. Payments made by the borrower are split between the balance and the interest. This clause shows how much of each payment is put toward the balance and how much is put toward interest. Prepayment. Prepayment is a term used to describe payments that are made before they are due. This clause explains how those payments are applied as well as whether the borrower will be penalized for paying off the loan early. Acceleration. This clause tells the borrower that if they do not uphold their obligations as promised by their signature, the lender has the right to demand that they pay the loan in full. Attorney Fees and Costs. If there is a legal dispute over the Hawaii promissory note, this clause explains how attorney fees and costs will be handled. The most common arrangements include the parties paying their own costs and fees or for the borrower to pay the lender’s costs and fees if the borrow is found to be in default by the court. Waiver of Presentments. This clause explains to the borrower that they are required to make payments as agreed even if the lender isn’t physically present at the time the payment is due. Severability. This clause explains that if part of the promissory note is found to be invalid, the rest of the document will remain in effect. Conflicting Terms. This clause states that if conflicting terms are found in the promissory note, an amendment will be drafted to clarify the conflict and to govern the agreement. Notice. This clause acts as an explanation of whether the lender will notify the borrower if they plan to sue for default. Governing Law. This clause determines the state that will govern the agreement. This is particularly important if the parties to the note are in different states. A Hawaii promissory note needs the signature (and printed name) of the borrower as well as the date that it was signed. There is no legal requirement to have the lender or witnesses sign. There is also no legal requirement to have it notarized.